Podcasts (new-fangled radio shows) are hugely popular these days. Quilters love them! We access episodes on our computers or smart phones when we’re sewing, binging-listening to stories of true crime, scientific discovery, or mysterious phenomena. 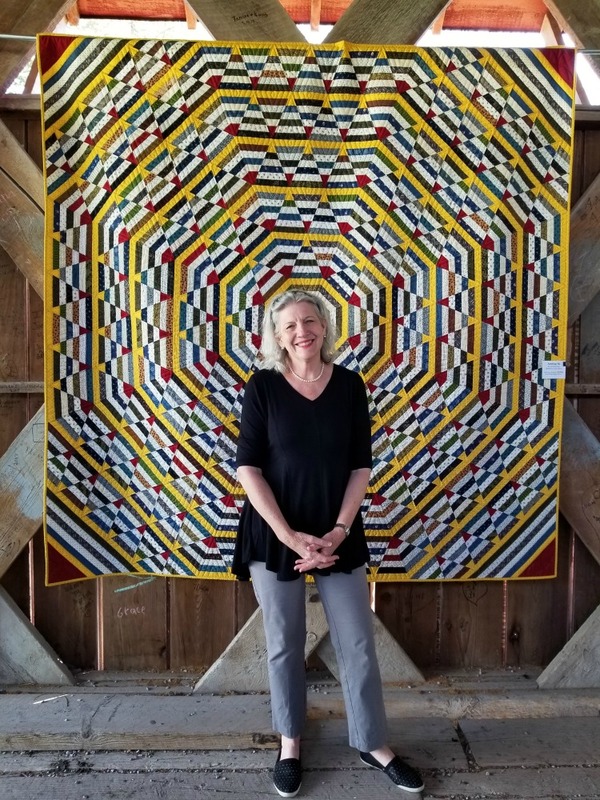 A podcast series specifically for quilters is “Just Wanna Quilt,” hosted by Tulane University Law Professor Elizabeth Townsend Gard. 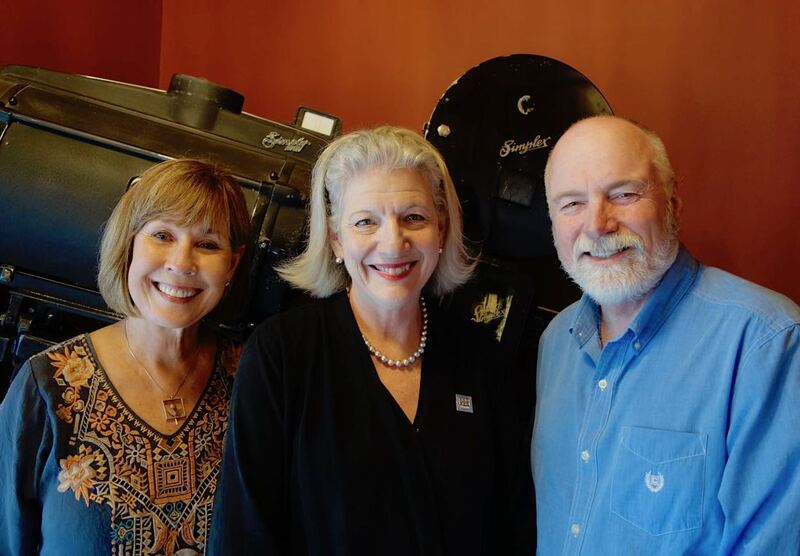 Dr. Gard and her colleagues (“The Quilting Army”) pursue quilting and study copyright law in relation to to the quilting industry—which is a good thing, as the nuances of trademarks, intellectual property, and copyright are as murky in the quilt world as they are in Hollywood. 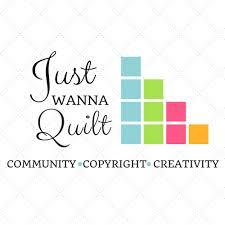 Previous guests on Just Wanna Quilt have been my daughter Mary Fons (in a joint interview with Tulia Pink) and other favorite people of mine including Alex Anderson, Pam Weeks, and Victoria Findlay Wolfe. I’ve made new friends as well, including Frances Dowell and Iowan Melanie McNeil. Dr. Gard interviewed me for over an hour a few weeks ago. 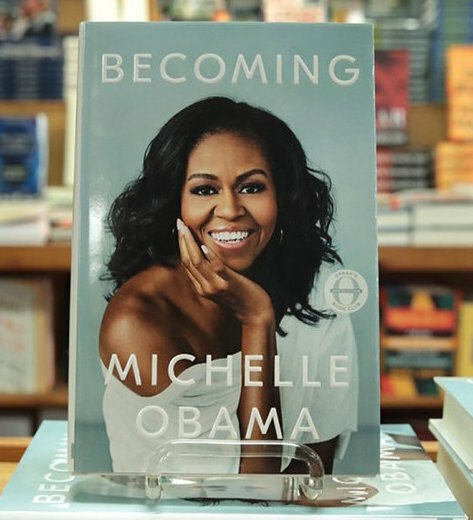 During our conversation, I inducted her into the Madison County Mutual Admiration Society, she inducted me into The Quilting Army, and I got to talk about my career, my children, the Iowa Quilt Museum and Iowa Theater in Winterset, my writing, and my fascination with Mary Shelley, among other topics. 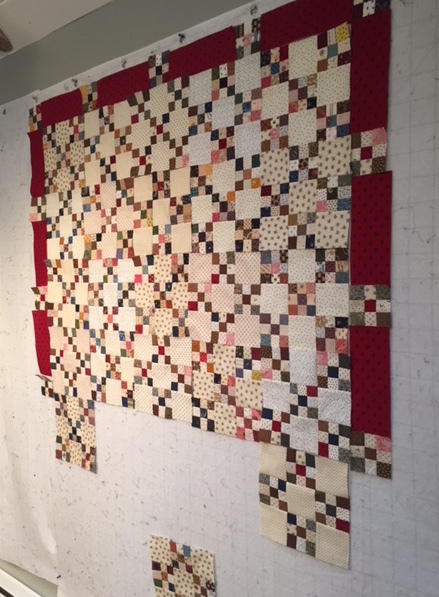 Get some patchwork going and tune in to my chat with Dr. Gard. Hope you enjoy! Quilters are nice people, but we can be snobs. When Liz Porter and I discovered patchwork in the mid-1970s, machine quilting existed, but self-respecting quilters eschewed it, pointing to ugly, puffy hotel bedspreads. We quilted our tops by hand. 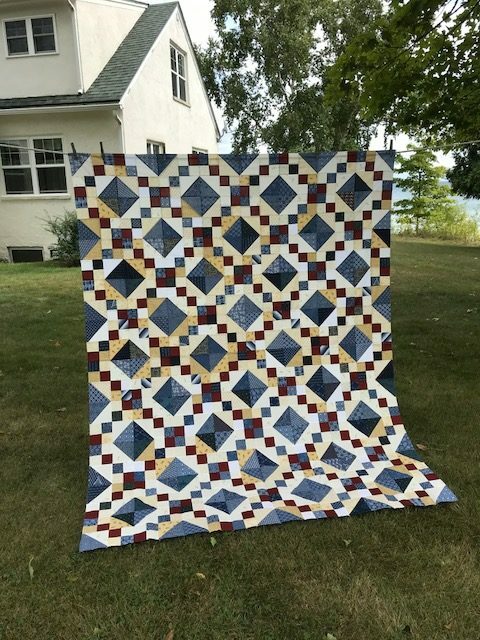 In the 1980s, along came the rotary cutter, followed by quick piecing techniques, which meant everyone was soon turning out tops way faster than we could hand quilt them. Enterprising sewists figured out how to achieve quality machine quilting on their domestic machines. Longarm manufacturers perfected their products, and no one who knows anything about quilts looks down on machine quilting any more. Until recently, I was a snob about pre-printed panels. 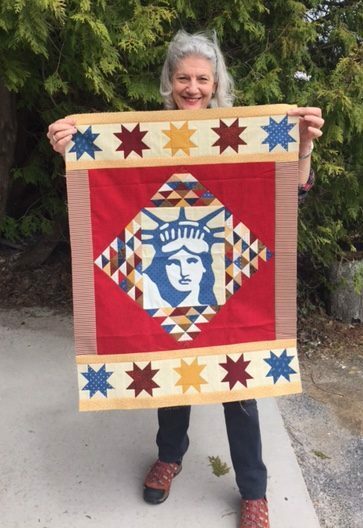 Yes, the artwork has become great, but yours truly doesn’t need help—I can design a whole quilt on my own, thank you very much. In September, I had the privilege of assisting with a Quilts of Valor award ceremony in Killeen, TX. The recipients were survivors of “Black Sunday,” an ambush and battle in Afghanistan in 2004 that left eight US soldiers dead and 60 wounded. The event was coordinated by Laura Winckel, and each red, white, and blue quilt unfolded was gorgeous. At the ceremony, the twenty-three recipients and their friends and family members far outnumbered the quilters in the room. I’m just back from Killeen, TX, where I lectured during the biennial (every other year) Crossroads to Texas Quilt Show. 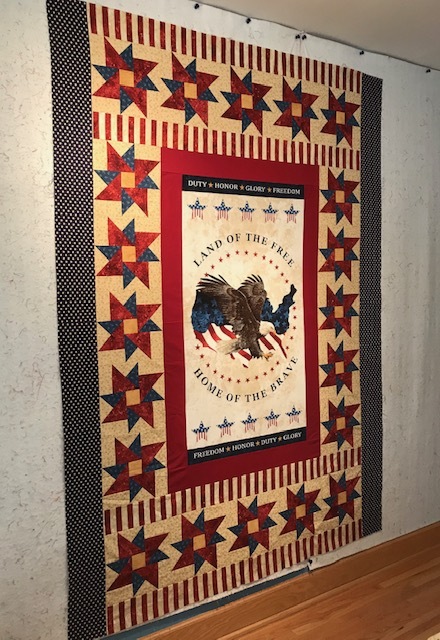 The exhibit and the people were wonderful, but the absolute highlight (for me) was the Quilts of Valor award ceremony conducted by Laura Winkel and members of the Quilters With a Heart QOV group on Saturday afternoon. Most of the over two dozen recipients had been part of a US Army unit that survived a devastating ambush in combat over ten years ago. The men were various shapes, sizes, and skin tones, and I was lucky to get to hug many of them as they were wrapped with their quilts. 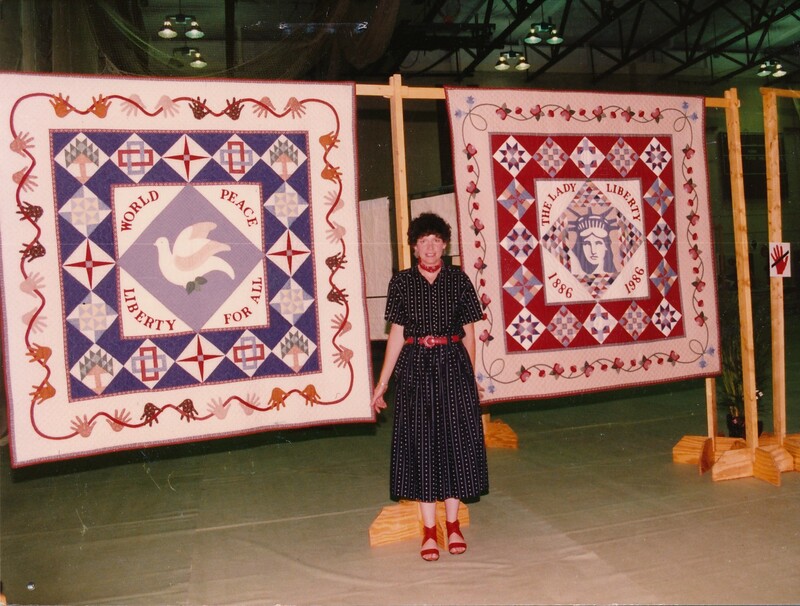 The quilts themselves were so perfect and beautiful, the audience of recipients, family members, friends, and quilters let out a gasp as one-by-one they were unfurled and awarded. The final awardee on the list was John, the point-of-contact who had helped Laura locate everyone else. He wiped away tears as he stood ready to be wrapped, and someone whispered to me John had lost his young son just three months earlier. While out on a run together the son suffered a fatal heart attack as a result of an undiscovered heart ailment. After John was wrapped, his many comrades in the room came forward to put their arms around him, embracing not only John, but his Quilt of Valor as well. 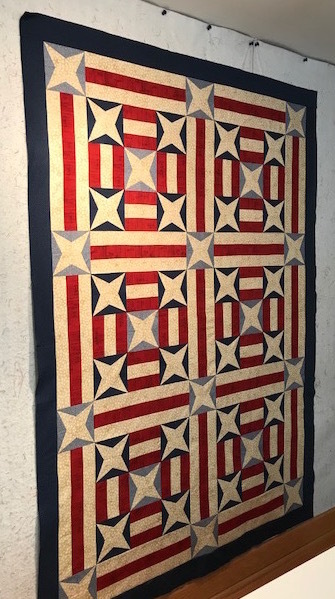 The quilt top pictured above doesn’t have a title yet, but soon it will named and quilted, and eventually it will become a tangible civilian thank-you for a man or woman’s military service and sacrifice.